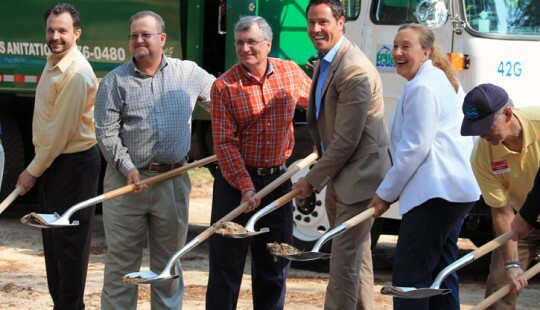 The Emerald Coast Utilities Authority has taken delivery of the first of 50 new compressed natural gas refuse collection vehicles, and Thursday, Energy Services of Pensacola broke ground on the first of three fast-fill CNG fueling stations. ECUA projects an annual savings of about $350,000 in maintenance costs and $900,00 in annual fuel costs. ECUA plans to convert an additional 10-15 vehicles in its water and wastewater fleet during the first year of the agreement, with additional vehicles converted over the next eight years as part of normal vehicle replacement schedules. 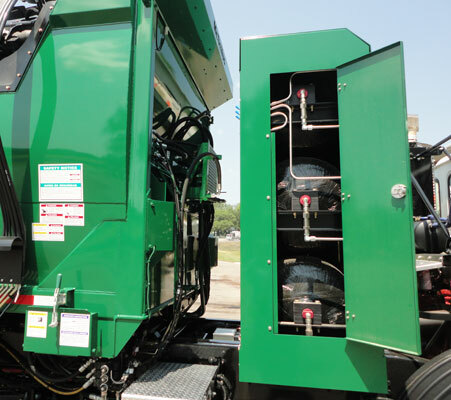 Instead of one large 80- gallon diesel tank on each sanitation truck, the new CNG trucks have three 25-gallon compressed natural gas tanks. The tanks are stacked between the cab and body or on the top of the body depending on the type of collection vehicle. The 50 sanitation trucks will cost ECUA $12,029,000, or an average of $240,580 per truck. ECUA expects a $20,000 per truck fuel savings per year over and 8-10 year lifespan for the vehicles. “ECUA customers will see a direct benefit. Currently the ECUA bills include a fuel surcharge that is based on the price of diesel fuel. At present market cost, the surcharge is $1.45 per month to a full rate customer. Because the price of CNG is appreciably less than diesel fuel, we expect our customers will realize an immediate savings through a reduced fuel surcharge once the switch to CNG has been implemented,” said Randy Rudd, ECUA director of Shared Services. The new ECUA fast-fill station on ECUA property near Pine Forest Road is expected to be operational by September. Under the terms of the agreement, ECUA will pay ESP a monthly transportation charge as well as an indexed price per diesel gallon equivalent of CNG fuel used by ECUA vehicles. ESP will operate and maintain the station, which eventually will be open to the public and third-party fleets. Pictured top: Patrick Zeiter and Winston Silvia of Zeit Energy, ESP Director Don Suarez, Mayor Ashton Hayward, and ECUA Board members Elizabeth Campbell and Larry Walker break ground for a fast-fill CNG station on ECUA property just off Pine Forest Road Thursday afternoon. 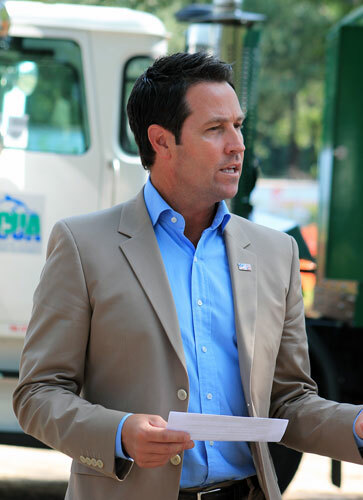 Pictured top inset: Pensacola Mayor Ashton Hayward speaks Thursday afternoon during a CNG station groundbreaking. 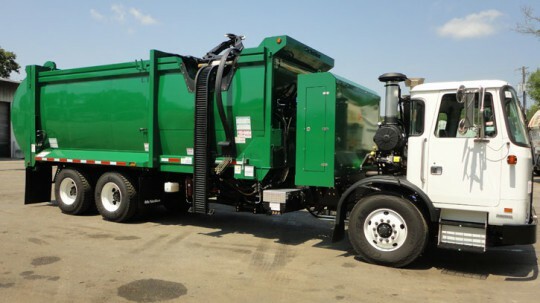 Pictured bottom inset: Three CNG tanks behind the cab of new ECUA waste collection vehicle. 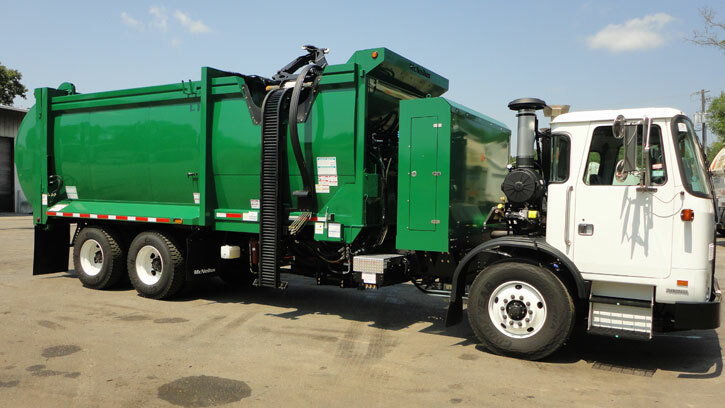 Pictured below: A new CNG powered ECUA refuse truck. Courtesy photos for NorthEscambia.com, click to enlarge. Is this gonna lower our garbage bill? This is the future of our country. Take the money from the so called green tech groups , and put it on design and distribution of this kind of product. its here , and it works. Wow, it could lower your bill. A $1.45 a month if they removed all the fuel surcharge. Not to interesting. But the headlines should be big if one of them ever goes off. contrast, the maintenance cost are well worth it.